The Fellowship was fortunate enough to obtain a copy of THE GINGERDEAD MAN #1 from Full Moon Features and Action Lab Comics. Brockton McKinney writes, Sergio Rios draws, and Marcelo Costa colors. Cup ‘O Joe is a nice little coffee shop on King Street, and Kayla runs the place. Her little brother Billy hangs around when he’s not in school – he’s a good kid, but he does like to play with fireworks. The only downside is that the shop is right next to the boarded-up Betty’s Bakery. And when some hoods break in and start messing around in the kitchen, they stir up a whole plate of trouble. This story is based on characters from the series of horror movies of the same name. And this book falls very clearly under Action Lab’s Danger Zone imprint. It’s a slasher story with a sense of humor, and a lot of drugs and violence and cursing and innuendo and, well, you name it. The title character is quite an energetic little killer, and the art does a really nice job of keeping up with it all, with a final full-page panel that really brings it home. If a fast-paced, drug-fueled killing spree is your cup ‘o joe, you will really want to pick up this book. It’s an awful lot of fun. 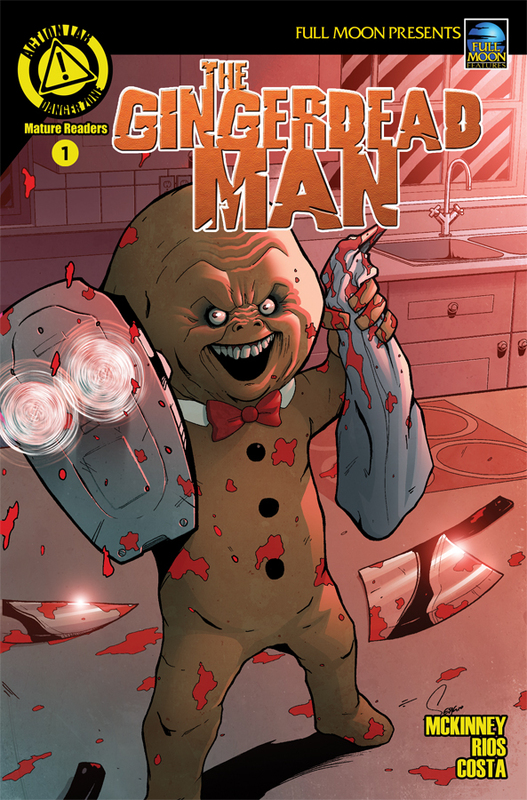 THE GINGERDEAD MAN #1 is available now at your FLCS or at actionlabcomics.com.